It has struck me more than once that a lot of the confusion that accompanies discussions about stuff like consciousness and free will, and intelligent design, and teleology, even the explanatory filter, and the words “chance” and “random” arises from lack of clarity over the difference between decision-making and intention. I think it’s useful to separate them, especially given the tendency for people, especially those making pro-ID arguments, but also those making ghost-in-the-machine consciousness or free will arguments, to regard “random” as meaning “unintentional”. Informed decisions are not random. Not all informed decisions involve intention. It was called Dr Nim. It was a computer game, but completely mechanical – no batteries required. 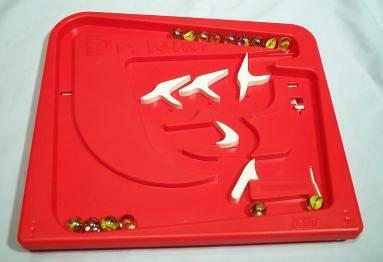 You had to beat Dr Nim, by not being the one left with the last marble, and you took turns with Dr Nim (the plastic board). It was possible to beat Dr Nim, but usually Dr Nim won. Clearly, Dr Nim is not acting “randomly”. It wins far more often than would a random system that selected 1, 2, or 3 marbles regardless of how many there are left. In fact, it seems to “know” how many marbles there are left, and chooses the best number to drop, accordingly. In other words, Dr Nim makes informed decisions. But clearly Dr Nim is not an “intentional agent”. It’s just a few plastic gates mounted on a channeled board. And yet Dr Nim behaves like an intelligent agent. It was certainly smarter than me at playing Nim! I suggest that the products of evolution look like the products of intelligence( as in informed, non-random, decision-making) because they are the products of intelligence (as in informed, non-random, decision-making). The mistake I think ID proponents make it to assume that such a system must be intentional. What’s the difference? I suggest that an intentional decision-maker is one that is able to model a distal goal, and select actions from a range of possible actions, on the basis of which is most likely to bring about that goal. And I suggest that humans, for example, do this by simulating the outcomes of those actions, and feeding the results of those simulations back into the decision-making process. This allows us to cut corners in a way that evolutionary processes can not, and evidently, do not. It also, I suggest, gives us enormous freedom of action – as in “degrees of freedom” – not to do “random” things (which would be the opposite of “intentional”) but things that we will – intend. Although sometimes it makes us not quite as clever. This entry was posted in Evolution, Intelligent Design, Mathematics, Metaphysics, Mind and brain by . Bookmark the permalink. I don’t think that’s what that means. I think that one can have a reasonable estimation of P(T|H), both in the OOL and Darwinian sense, by using research in samples areas and search algorithms like Dr. Axe, Dembski and others have done to quantify (as best we can) resources, target areas, search space and available kinds of mechanisms to produce what we see. Could it be incorrect? Sure. But IMO, the P(T|H) in biology is similar to what we found in cosmology some time back when they calculated possibility of the target (the way the cosmos actually looked) against the targets one would expect to acquire with chance distributions of matter (given the amount of matter estimated to be in the universe). These probability distributions about how smooth the universe should be, given estimated time, initial conditions and amount of matter, didn’t come from specified, complete knowledge about such things – but rather from best estimates, know capacities and projected extrapolations. However, because you don’t agree with how ID proponents calculate P(T|H) – which, as far as I can tell, is achieved by comparing the currently known target space against the estimated full search space of possibilities on a flat probability distribution (with various modifiers in favor of non-ID explanations) – doesn’t mean that they do not calculate it, or that how they calculate it is arbitrary. They could be mistaken about the target space, the resources available, the search space, and the distribution of probabilities, but so what? I never claimed they weren’t mistaken about those things. I’m addressing claims that they don’t make such calculations and that essential aspects of their formula are arbitrary. William J. Murray: I don’t think that’s what that means. I think that one can have a reasonable estimation of P(T|H), both in the OOL and Darwinian sense, by using research in samples areas and search algorithms like Dr. Axe, Dembski and others have done to quantify (as best we can) resources, target areas and available kinds of mechanisms to produce what we see. Could it be incorrect? Sure. But IMO, the P(T|H) in biology is similar to what we found in cosmology some time back when they calculated possibility of the target (the way the cosmos actually looked) against the targets one would expect to acquire with chance distributions of matter (given the amount of matter estimated to be in the universe).These probability distributions about how smooth the universe should be, given estimated time, initial conditions and amount of matter, didn’t come from specified, complete knowledge about such things – but rather from best estimates, know capacities and projected extrapolations. You seem to be missing the point, William. Sure, you can try to calculate how probable it is that we’d see what we do see, given non-design, but that’s not what CSI does – it can’t do, as it requires that we do that calculation before we can compute CSI. And so unless the instructions for computing CSI include clear instructions as to how to compute p(T|H), then we have no clear instructions for computing CSI. Which is what some of us have been saying. Attempts in which p(T|H) is assumed to be low merely assume their conclusion. However, because you don’t agree with how ID proponents calculate P(T|H) – which, as far as I can tell, is achieved by comparing the currently known target space against the full search space of possibilities on a flat probability distribution (with various modifiers in favor of non-ID explanations) – doesn’t mean that they do not calculate it, or that how they calculate it is arbitrary. They could scarcely say that if the’d already calculated FSC on the basis of including potential evolving pathways in their null. And, indeed, they do not. So where are these “various modifiers in favor of non-ID explanations”, William? Can you point to a single place where these have been in corporated into any calculation of p(T|H)? They could be mistaken about the target space, the resources available, the search space, and the distribution of probabilites, but so what? I never claimed they weren’t mistaken about those things. I’m addressing claims that they don’t make such calculations and that essential aspects of their formula are arbitrary. Well, please provide a citation in which an ID proponent calculates p(T|H) (or equivalent) where H takes into account Darwinian and other material mechanisms (as Dembski says, correctly, that it must). In other words, in which they don’t arbitrarily treat p(T|H) as being equal to p(T|independent draws) or as being simply “low”. If you can’t, then our claims stand. William J. Murray: However, because you don’t agree with how ID proponents calculate P(T|H) – which, as far as I can tell, is achieved by comparing the currently known target space against the estimated full search space of possibilities on a flat probability distribution (with various modifiers in favor of non-ID explanations) – doesn’t mean that they do not calculate it, or that how they calculate it is arbitrary. Let’s say that out of all possible amino-acid strings less than some limiting length, a tiny proportion are “functional” (by which I will assume we mean: fold to make a protein that helps an organism reproduce). That proportion can also be called the probability of finding such a protein if you had a bag of all possible strings and drew one out. Clearly, if you have lots of independent draws (more “probabilistic resources”), the probability would go up, and we can calculate the probability of getting one eventually as a function of the number of draws: (1-(1-p)N where N is the number of draws. However, for a very tiny value of p, to make the probability of getting one eventually reasonable, you might have to make N larger than the total number of events that have happened in the universe. At which point (actually long before) we could reasonably conclude that if we found one of those functional proteins by such a method, we’d cheated in some way (peeked into the bag, say). And we could slightly modify the assumptions above (which assume that all amino acids are equally likely) to make our bag of proteins contain amino acids in non-equal proportions (non-flat distribution). But that wouldn’t make much difference to the final calculation. It might make a little – for example if functional proteins tended to have rare amino acids, it would make it less likely that we’d find them, whereas if functional proteins tended to have more common amino acids, then it would make it slightly more likely that we’d find them. But it’s not terribly important for the simple reason that nobody proposes that proteins are found by a series of independent draws from a bag, without peeking. That is exactly what Darwin proposed did NOT happen (even though he didn’t know about DNA or amino acids). To stick with the bag analogy, we would have to imagine that you keep on picking proteins out of the bag blindly until you find a single one that is ever so slightly functional (and in a very simple critter, it might be a longer-than usual one, long enough to stop holes in the membrane, say, or change the osmotic pressure). At that point, suddenly the vast majority of proteins in the bag become the same, or very similar to the one you just drew. And you keep on picking until you get one that works better still. And again, now the proteins in the bag mostly become copies, or near copies, of the one you just drew. And so on. This will clearly hugely increase your chances of ending up with a collection of functional proteins, and, indeed, of ever more functional proteins, no matter how many useless proteins are theoretically possible. And that is what p(T|H) has to take account of, not just whether the amino acids are drawn from a flat distribution, or a somewhat more realistic non-flat one, but whether the “draws” are independent. The theory of evolution (the thing that has to be taken into account when computing p(T|H) says that the draws are not independent – that what you draw affects the subsequent pool of things you draw from, a pool that is hugely enriched by items that function a little better than other things. Not in terms of OOL. – that what you draw affects the subsequent pool of things you draw from, a pool that is hugely enriched by items that function a little better than other things. Again, this is outside of the OOL question. You can certainly have that view, Elizabeth, but that doesn’t make it the correct view. After OOL, a pool of already-functioning proteins that are self-replicating with chance variations may make it easier to construct new proteins with different functions, but just because it makes it easier doesn’t necessarily mean it makes it scientifically plausible. No, that’s not how ID proponents compute p(T|H). I’ve never even seen a calculation for p(T|H). If you’ve never seen it, how do you know that’s not how they calculate it? Attempts in which p(T|H) is assumed to be low merely assume their conclusion. Even if it was an assumption, it wouldn’t be a groundless assumption. There are many assumptions in all walks of scientific theory, some which pan out and some which are later discarded. As far as I can tell, there is a lot of scientific literature regarding the problem of finding functional proteins (1) at OOL (if it wasn’t a problem, then OOL wouldn’t be such a long-standing, problematic issue, and (2) even given Darwinian processes (as per Axe’s work and the work of others that seek to make the problem of finding new, functional proteins more reasonable under Darwinistic evolution). But again, even if it was an assumption, that doesn’t make it arbitrary. It could have been that whatever proteins could exist, there was a very, very small search space that would have made all functional proteins fairly easy to search out. It could have been that all amino acids were left-handed, or it could have been that there were binding affinities that made all functional proteins virtually inevitable. In these events, the (P(T|H) might have been so high as to remove proteins from consideration as evidence of ID. But, that’s not what we have, as far as we know, and their assumption (arguendo) comports with known facts and, as far as I can tell, even the non-ID consensus. But again, even if it was an assumption, that doesn’t make it arbitrary. In other words, to calculate P(T|H) we need to know the probability that Darwinian evolution could have produced what we observe. And as the entire point of the calculation is to determine whether it could have done, the entire concept is circular. You need to know the answer before you can find the answer! CSI boils down to P(T|H). Without a way to calculate that probability, CSI is a bogus concept. William J. Murray: Not in terms of OOL. No indeed. For OOL, you would need to take into account the appropriate non-design hypothesis, which couldn’t, by definition, include Darwinian processes. However, you’d also have to compute the complexity of the pattern, and we can’t do that because we don’t have the pattern. Again, this is outside of the OOL question. You can certainly have that view, Elizabeth, but that doesn’t make it the correct view.After OOL, a pool of already-functioning proteins that are self-replicating with chance variations may make it easier to construct new proteins with different functions, but just because it makes it easier doesn’t necessarily mean it makes it scientifically plausible. We don’t yet know what post OOL organisms even looked like, or whether they had functional proteins at all. Some people do think that peptides preceded RNA, but we don’t know. Be careful not to move the goalposts, here, William. You originally disputed claims made here (including by me) that no-one in ID had shown us how to compute CSI. That claim still stands. If you simplify the problem by moving your CSI back to a time before there were even self-replicators, so obviating the need to account for Darwinian processes, you create a new problem which is estimating the complexity of the postulated self-replicators – which we don’t have to hand. And I have to repeat: Scientists don’t claim, qua scientists, that we know that no designer was involved in the creation or diversification, or adaptation of life. All we claim is that there is a) no (independent) evidence for such a designer and b) lots of candidate mechanisms, many of which are very well understood and can be observed to do the job they are postulated to do. Well, I’ve read a lot of ID literature, including papers by Axe, Abel and Dembski and I have not seen it calculated. If you can show me where it is calculated I will gladly retract my claim. I have, on the other hand, seen a number of attempts to calculate it, and claims that it has been calculated. In not one of those have I seen any attempt to compute p(T|H). Even if it was an assumption, it wouldn’t be a groundless assumption.There are many assumptions in all walks of scientific theory, some which pan out and some which are later discarded. Of course there are. But if they include an assumption regarding what is to be concluded, the argument is invalid. You cannot assume the consequent. Let’s say I assume that p(T|H), where H is the null hypothesis that Darwinian and other material mechanisms resulted in this functional protein. I find a protein that has 500 Fits under the null hypothesis of random independent draws (as Durston et al do) and I plug that value into the CSI equation (or the KF’s CSI-lite) without adjusting those Fits to take account of a null that includes Darwinian and other material mechanisms, then, clearly, I will get 500 Fits and can conclude design. However, if I adjust my null on the principle that Darwinian and other processes make the protein more probable, then that number of Fits will come down – now we can’t conclude design. In other words, whether we can conclude design depends entirely on how probable we assume it is that Darwinian and other processes could have produced it. If I assume that probability is low, I will infer Design. If I assume it is high, I will not infer Design. My conclusion as to whether the thing was designed or not therefore depends entirely on whether I assumed it probably wasn’t, or probably was, in the first place! You are a little confused. Nobody actually proposes that the first Darwinian-capable life forms were DNA-based protein-coding life forms complete with tRNA and mRNA and ribosomes. If they did, then IDists would rightly say: but that can’t possibly have happened spontaneously in a warm little pond. Absolutely. You don’t need to compute any fancy CSI value to come to the conclusion that such a life form is extremely unlikely to have formed spontaneously in a jar of peanut butter or anything else. The working assumption (not conclusions) is that the earliest life-forms, or at least ancestral self-replicators were far far simpler, and that Darwinian processes got them as far as the DNA system we know today. But we don’t know how – that’s what OOL research is about. And, of course, we may never know – from which you might infer design, or, merely, that it’s still an unsolved scientific problem. and (2) even given Darwinian processes (as per Axe’s work and the work of others that seek to make the problem of finding new, functional proteins more reasonable under Darwinistic evolution). Well, not really. There’s plenty of work into protein evolution by people other than Axe. The issue really hinges on what I said earlier, that “function” isn’t a straightword measurable variable – whether a protein is “functional” depends on whether it has phenotypic effects; in multicellular organisms, where it is expressed; whether the environment currently or ever did render those phenotypic effects advantageous or disadvantageous (i.e. make the organisms more or less likely to reproduce successfully). Axe doesn’t know these things a priori – nobody does. But again, even if it was an assumption, that doesn’t make it arbitrary. It could have been that whatever proteins could exist, there was a very, very small search space that would have made all functional proteins fairly easy to search out. It could have been that all amino acids were left-handed, or it could have been that there were binding affinities that made all functional proteins virtually inevitable. Inthese events, the (P(T|H) might have been so high as to remove proteins from consideration as evidence of ID. Well, only if “functional” was binary property of a protein. It isn’t. It’s a continuous property of a protein within an organism, and whether it is positive, negative or neutral depends on what it’s doing, when, and where, in what environment. A very simple protein might be highly advantageous for a very simple organism, but non-functional, or even lethal, in a much more complex organism. No. the assumption comports with no known “facts” at all. It’s a conclusion masquerading as an assumption. Darwinians are no more entitled to say that p(T|H) conclude high than IDists are to say that p(T|H) is low. All we can do is to say, given that we observe T, what mechanisms can we propose that could account for it? And how can we test whether these mechanisms produce the results we propose they do? CSI boils down to P(T|H).Without a way to calculate that probability, CSI is a bogus concept. Where “bogus” doesn’t literally mean “deliberate fraud” but :doesn’t do what it says on the tin. Even if the tin purveyors don’t realise that yet. Indeed. Clarification accepted and appreciated. It’s just that Kairosfocus got very upset on one occasion thinking that by calling CSI “bogus” we were implying deliberate fraud. I don’t think homeopathy is fraud, but I do think it is bogus! You are very generous regarding homeopathy. Regarding ID, we had the debate in open court with testimony under oath and real money at stake. Those who were invited to testify and declined forfeited their opportunity to make their case. No, they don’t. Even assuming (arguendo) that the P(T|H) is low doesn’t mean the resulting computation of FSCO/I will warrant a finding of ID. Indeed. It could have been that all functioning, biological proteins were of a short enough length and broad enough in specificity requirements that the larger computation (of which P(T|H) is a subset of) renders a finding of less than 500 bits chi – not enough to warrant a finding of ID. IOW, if we found that all functional proteins had, say 10 or fewer amino acids, and that everything above 10 sequences was, as far as we could tell, non-functional; and that we had the same number of functional proteins; then the P(T|H) would be the same (same search space pool inclusive of estimated non-functioning + estimated functioning proteins, same target – the set of all functioning proteins (assuming equal quantities of functional proteins in both cases), same random draw flat distribution) – but because of the much lower demands of functional complexity and specificity for the particular proteins in question, ID may not be a supported inference of the larger calculation. IOW, the assumption (arguendo) that there is a low P(T|H) doesn’t by itself make the case that any particular protein should be considered ID. Since that is the case, it could have been that all proteins used by living systems would have fallen short of th FSCO/I metric, even given the low P(T|H) . It does if the object under discussion is highly improbable under the null of independent draws. If it more than 500 bits (i.e. p<1/10^150) under the null of independent draws, whether it has CSI (ie. whether it warrants a finding of ID) will depend entirely on the value you set for p(T|H) under the null of Darwinian and other material processes. Indeed. It could have been that all functioning, biological proteins were of a short enough length and broad enough in specificity requirements that the larger computation (of which P(T|H)is a subset of) renders a finding of less than 500 bits chi – not enough to warrant a finding of ID. Sure. But if p(T|H) where H is Independent Draws is more than 500 bits, whether it’s still more than 500 buts when H takes account of Darwinian and other material mechanisms will depend entirely on what value you take for p(T|H) under that H.
I think you are conflating two things here: the complexity of an individual protein, in Shannon terms (which will be a function of its length, and can be measured in bits) and the probability of drawing one functional protein from a vast pool of non-functional proteins, which will not be a function of the length of the functional proteins, which can also be expressed in bits, but will not be affected by the length of the protein unless we make the draw non-random in some way, and make the shorter proteins more likely to be drawn than longer ones. I think the confusion arises because of this word “bits”. Any number between 0 and one can be converted into a positive number of “bits” by taking the negative base 2 log. That means that any probability, or proportion (number between 0 and 1) can be expressed as a positive number of bits. The tinier the probability (or, equivalently, proportion) the larger the number of bits. Whether those bits represent “information” or not depends on how you are interpreting the probability. But intuitively, it makes sense to think of a rare thing as requiring a large amount of information to encounter with any degree of reliability, whereas a common thing you could easily trip over without even looking for it. When it comes to strings, we can also express the quantity of information (Shannon information) in bits. If we have a string of letters, and the letters are equiprobable, then each item in the string will have a 1 in 26 probability of being any given letter. -log2(1/26) is 4.7 bits, so each item in the string will have 4.7 bits. A string 10 letters long will have 47 bits. Because logs are neat things those 47 bits can also be converted back into a probability, which is 1/26^10, and that probability is the probability that if you drew one string from a bag of 10 letter randomly ordered strings of letters, you’d get that one original string. So here is the confusion: the bits possessed by one of your 10-amino acid proteins strings tells you the probability that you would draw that protein from a bag of 10-amino acid proteins, in which the proteins consisted of randomly assembled amino acids. It doesn’t tell you how probable it is that you would draw that protein from a bag not only of 10-amino acid proteins but of much longer proteins as well. Clearly that probability would be much smaller (and the number of bits representing that probability would be much higher). But where you are of course correct is in saying that if a thing is probable under the null hypothesis of random independent draws, it will be at least as probable under a hypothesis that makes it more likely! However, if a thing is very improbable under the null hypothesis of random independent draws, whether it is still improbable (e.g. over 500 bits, i.e. p<1/10^150) under the null of Darwinian and other material mechanisms depends entirely on what probability you give that null. And this is why CSI is circular. But to repeat: if something is improbable under the null of random independent draws, whether it is still improbable under some other hypothesis depends entirely on the degree to which that other hypothesis makes it more likely! And if that is what you want to know, then you can’t assume a value a priori, and then shout eureka! when it comes out the other end! I’ve known quite a lot of homeopathic practitioners and I think they all, without exception, believed absolutely that their prescriptions worked. I think companies like Boots are merely cynical, and flog the stuff because it sells, knowing the literature that shows it doesn’t work. 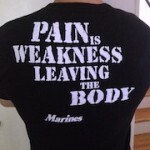 But the actual practitioners (not sure about the manufacturers) I think are honest (in my experience).